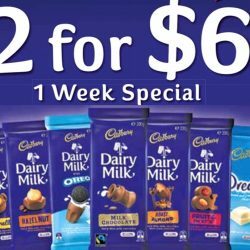 Cadbury: Buy 2 Blocks of Dairy Milk Chocolate for $6 at Major Supermarkets! Chocolate lovers, dun miss this 1 week offer at major supermarkets including Cold Storage, FairPrice, Giant & Sheng Shiong! Pay $6 for 2 blocks of Dairy Milk Chocolate from now till 15 March 2017! Purchase $8 worth of Cadbury and/or Toblerone products and stand a chance to win a trip to Tokyo!